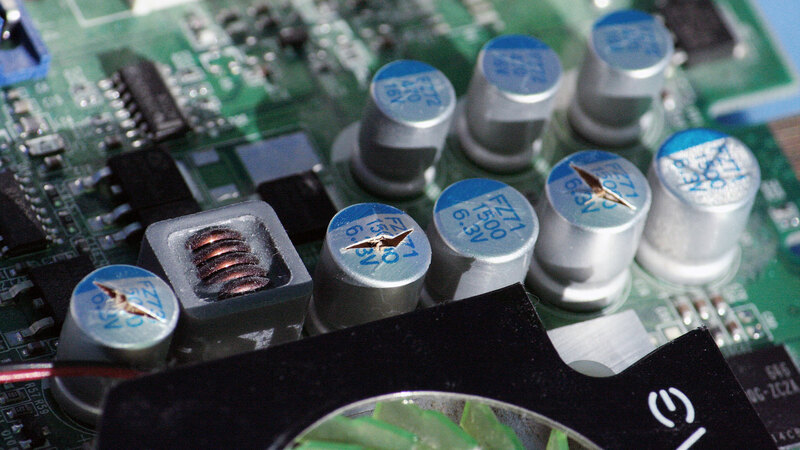 NVIDIA Graphics Card: Blown Capacitors. I have an EVGA NVIDIA GeForce 7600 graphics card that had some problems. Upon closer inspections I noticed three blown capacitors in addition to a non-functioning heatsink fan. The blown capacitors are two FZ71 and one FZ73. Not really sure if the malfunctioning heatsink fan had something to do with the blown capacitors. The capacitors blow most of the time like this through overheating. The picture you showed is the best indicator that another certain component doesn’t do its job right, or that there are of low quality. As you mentioned is your Fan not working, which will be the source of your problem. Once you replaced the fan with all the other electric components, it should work as fine as before. Probably low quality chinese made capacitors that tend blow after a short while, I had the same FZ73 1500uf caps blow on my XFX geforce 8600GT and my heatsink and fan are working fine. Same here. Thinking about replacing the capacitors. Any chance this will fix the problem? FZ74 and FZ75 capacitors on mine. Dude I had the exact same problem. I think it was my crappy CPU fan that helped it overheat. I live in Canada though, anyone know where I can get replacement caps? Definitely wanna try to do it myself before buying a new one. P.S. I heard EVGA offers lifetime warranties, not sure if I got one on my card. Does this even count as a stand-alone EVGA product? Or would it only be replaceable with an NVIDIA warranty..
evga – you have to a) buy a card that includes the warranty specifically and, b) register within 30 days to activate the warranty, or lose it. I think XFX was the same way. Try digikey.com, part number 565-3229-ND for the FZ74 caps, that’s the closest I found. I haven’t tried them out yet though, still looking for the fan. I just had major flakiness on an EVGA Nvidia 8500GT video card, and after pulling it out I noticed that one of the F275 1500uF 6.3V capacitors had ruptured. I scrounged a pile of old motherboards and found an exact value replacement and swapped it out; so far so good. I’ve exactelly the same problem on a MSI NX6200AX-TD256H video card (it’s the one without fan). Four FZ71 (1000 6.3V) capacitors exploded in my PC and now my video card is totally broken. it is the capacitance value that you have to match. meet or exceed the voltage value. obviously a higher voltage would be prefereable since it seems the caps are weak anyway or the voltage they see is too close to their max as stated on them. I had the same problem just today. 3 capacitor blew out, but i just swapped with ones of the same specs that was on an old Ati X1300. And for now the GPU its working like it never happened. Kinda weird that it actually worked, but in anyway. It’s better than spending money in a new one. Czym jest pokrywany radiator na styku z procesorem w karcie Ge Force FX 5200 128 MB/DDR? Jaka mogła być przyczyna pęknięcia kondensatora nr C39 FZ71 1000µF 6,3V ? I had a problem about 2 weeks ago after an intensive night of BEAST (don’t even ask!). Anyhow, computer had restarted when I got back to it in the morning. I then noticed glitches, and my computer freezing. I just managed to shut it down in time. Upon examining my board, noticed two FZ5B 1500 6.3V caps popped on my GEFORCE 7600GS. Will try to find replacement caps in other motherboards. Thanks. Same situation, I saw artifacts loosely resembling a waving American flag pop up all over. Got progressively worse over a period of a few minutes, and upon turning it off and letting it cool, the restart showed that the screen was pretty much just random patterns of colors. Cracked open the tower to see all but one of the 6.3V caps had popped on my EVGA 7600gt. Have only been web browsing for the past 6 months or so (no games), so the only thing I can attribute to this is the new driver update I did a few days ago. I’ve heard that had issues with fan speeds, but they started popping before I could roll back the update (literally had it downloaded too). No good, but a fine excuse for an upgrade to a card with an HDMI out. Yep… my GeForce 7600GS fan went out (2 years running non-stop in normal conditions) and I blew all 6 of these cheesy non-incased aluminum shelled capacitors. They got too hot. I had the same problem. Replaced 3x 1500uF 6.3v caps with 1000uF caps. Working okay so far but surely bound to stress some other component(s) in the long term. Just blew 5 FZ73 caps on a 2 year old GeForce 7600GS. I heard them pop. It was like small firecrackers in my tower. I wasn’t sure it was my PC until my video started gettin sketchy. I pulled out the card and could clearly see their guts sticking out. Also, my fan was completely overrun by dust. I’m almost positive that the fan heated up under the stress of the grime that had accumulated on it. So rather than cooling the card, the fan was creating more heat. Combine that with a 98 degree day and POP! I immediately order a handful of 1500uF/10V caps from Mouser. Here’s to hopin it’s a five dollar fix and not a fried chip. I have this same problem with my ZOTAC 8600GT but I believe about 5 or so caps are blown. Might try to fix it, the monitor was still getting a picture but it was all just lines and blocks, couldnt make out the display. The fan and heat sink were working fine, and I even have a small slot fan under the video card aswell to help out. I dont do any gaming, used to watch movies when my tower was in the bedroom but moved and now its in den so mostly just surf the web, etc. My computer is a few years older though and the on board graphics is crap, doesnt support high res for my widescreen 20″ Its at like 800×600 I think. just replace it to another capacitor 1500microfarad / 6.3 volts then its work again.. promise..
the capacitor is so very cheap about 20cent us dollar per piece.. I had the same problem here with 2 x GeForce 7600 GT cards in the same machine. I was running 4 monitors. The capacitors are all crap. They probably cheaped out them. I had 2 blown (the same two as in the picture above) across the inductor. But I pulled all of the 1500uF 6.3V caps on the board and tested them all. ALL of them failed the leakage test. So the best thing to do on those is to replace them all. Even if they look good, replace them. The 1000uF 16V cap tested fine. Interestingly enough, just yesterday I discovered the exact same problem with my EVEA 7600 GT. The fan was also giving me trouble in the past; I wouldn’t be surprised to learn that the fan stopped working and caused this problem. The very same problem. I remember about 2 months ago hearing what sounded like a gunshot in my room here. Didn’t think anything of it at the time and thought it was something from outside. But three days ago, I, thinking it was a problem with the PSU, went and got a new one of lower power (100W lower) and installed it. But still nothing from the graphics card itself, same one as commonly noted here, the 7600. Opened up the case and found that 5 of the 1500 6.3V caps were blown and one of the 470 16V caps was blown as well. Thankfully I’m getting a new graphics card for my up-coming birthday, and it’s not going to be a 7600 or any other branch from the makers that produced this card as I’ve read in countless spots from online that this is a very common issue. Very disappointing. My video card had two 1500 6.3 V and one 1000 6.3V to pop. I want to replace them them but I am having prolems getting the solder or whatever is holding them in off. I have bought new solder and desolder irons and none of it will melt whatever is holding them in. What is my problem and is it possible to fix this Card. It is a Nvidia 6800GT card. To be honest, I wouldn’t bother replacing the Capacitors if I could find better card for the same price. I just played with this most of the day yesterday. Seems like the solder has a hotter heat or something. I had no problem removing caps from an old motherboard. I found that I could pull the blown caps off, then grab the post with a pliers to help remove it. Flux seemed to help. The braid I got at Radio shak did not work well at all. But I did fix it! The video card is now working with different 1500 6.3 volt caps. I did notice a replacement video card was only 30 bucks now, so it may not be worth all the effort. Who knows how to get these capacitors video card. A fast time working nien. far too slow. At the time of check and clean the tower that had I met these rebentados (open). Quien sabe como conseguir estos condensadores de una tarjeta de video. Un tiempo que funcionaba bien rapido. ahora demasiado lento. Al momento de revisar y limpiar la torre me encontre que tenia estos rebentados (abiertos). Como conseguir para reemplazarlo y que funcione bien. Dejo los numeros de serie y su descripción. para que me ayuden!!. I have a 8600gt and i only replaced the 3 1500uf caps bcoz it was visible that it was blown out. so after replacing i connected it to the pc and switched it on and i get a funny resolution and colour in my display and when i restart, it doesnt work. only once i switch it off and remove the plug of the monitor cable and replace it and switch it on the computer starts up. After this there is this blue screen showing the error screen. any ideas why? Should i have to replace the other 470uf cap as well and could it work. Please let me know a solution quick. As long as the capacitors are not blown or deformed, I don’t think you have to replace them. Could you please tell me where is the location has ground area to be more detail. Since i also do the soldering by myself. Hopefully after i changed the cap, my graphic card will just fine. Another things, by changing the cap should i don’t bother about ripple current from the cap? I’ve 3 Nvidia 7300LE with 4 capacitors blown. And one capacitor I do not know if blown or not. I’ll try to replace them and let you know if the cards work again. It worked, but I had to replace the 5 capacitors in both cards. I had this same problem on my EVGA geforce 6600. When I spoke on the phone to get warranty support they repeatedly claimed that it was not a reported issue, therefore my claim was not valid. This single thread alone says otherwise. After hours on the phone and via email with supposedly one of their engineers, they sent me a new card (a 5600) with less functionality than the bad card, and then tried to bill my credit card for it. Since then the replacement cards fan has been howling intermittently, despite frequent dust removal of the entire PC and VGA card fans with compressed air. After that experience, I have not, and will not, do business with EVGA again. i got a used computer for free and noticing the fan doesnt move on the video card GeForce 7300 GS. Blown capacitors 16v 1000 fz69, 3-4 of them.. they appear to all be 16v 1000 fz69 but its hard to tell..
Overclocking for game play is a great way for the caps to pop. If you are overclocking your video card make sure the fan is working properly they do get hot. capacitors are cheap and easy to install if you know how to solder. It should take about 30 min to replace the caps make sure you get the polarity right. Its cheaper than buying a whole new video card. But they are getting cheaper too. There could also be a short in the circuit board of the video card. Make sure you get the right micro farad capacitors. We all have the same problems with bad caps. By the way. I dont know anything about this so if anyone can tell me if i have to replace caps that seems fine too? And how to select the correct ones if they say FZ73 1000 6.3v and FZ73 470 16v are they1000mF or 1000uF? capacitors? and 470mF or 4700uF? Thanks! !